TellNoTales.com spoke with Walt Disney Imagineering's Jason Surrell regarding the upcoming release of his book about the Pirates of the Caribbean. 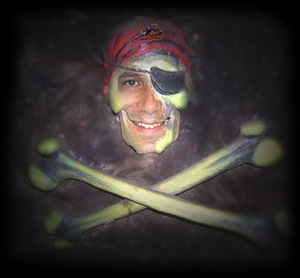 Jason recalls the path he took to his role in Imagineering, and reveals some interesting secrets about Disney's famous swashbuckling attraction.. and even sends one fabled rumor straight to Davey Jones' locker. Note: If you haven't already ordered your copy of the book, you can get one at a fantastic discount by purchasing it from Amazon by clicking here .
) What drew you toward using your particular talents in the world of theme-park design? I started my Disney Career with the Walt Disney World College Program in the summer of 1989. I was a skipper at the Jungle Cruise, which is just about the best first Disney job you can have. The following summer, I transferred over to Epcot Entertainment, where I worked as a performer. In January of 1991, after I had moved down to Florida full-time, a fellow Cast Member and I pitched an idea for a character Christmas show at Epcot. Somehow, the concept managed to work its way through the approval process and I actually got produced. I got to write the script and serve as something of an "apprentice Show Director." Then I transferred over to the Disney-MGM Studios, where I continued to pitch shows as a kind of "extracurricular activity." A couple of them involved attractions, which obviously fall under the purview of Walt Disney Imagineering. That's when I met Senior Show Producer Mike West, who was my first mentor at WED (sorry, couldn't resist). That's also when I realized that I didn't need to be an artist, architect or engineer to work at Imagineering. Mike encouraged me to get as much experience as I could, which I did by going off to Universal Studios for almost five years to work as a writer and director of live shows and, toward the end of that period, attractions. I wrote the scripts for A Day in the Park with Barney at Universal Studios and the Jurassic Park River Adventure at Islands of Adventure, both of which are still open. At the end of those five years, I had the experience to come back to Disney as an Imagineer and I've been here ever since. What is it like to have access to the Disney archives, and how did you keep yourself focused on the task at hand? As a Disney fan, the opportunity to dive into the Walt Disney Archives at the studio and our own library of art and photography is like discovering Isla de Muerta, no corniness intended. When it comes to original Imagineering art in particular, it's VERY hard not to explore for hours on end, but stiff deadlines generally keep me focused on the task at hand. Fortunately, I've wound up working on books on all my favorite attractions, which means I'll eventually be able to take the time to look through almost everything that means something to me. In the Pirates of the Caribbean attraction, there's a popular story that one of the faces is based on Sid Caesar. It's also been said that the Imagineers themselves used their own facial features for the pirates. Is there any truth to either of these rumors? That's probably the biggest misconception about Pirates. Blaine Gibson told me point blank that not one pirate is based on a specific person, including Walt Disney and Sid Caesar. I know the pirate you're referring to, and he does bear some resemblance to Sid, but that wasn't a conscious thing on Blaine's part. The Auctioneer is in fact inspired by an actual person, a WED architect at the time of the show's development, but Blaine would like to keep that person's identity anonymous. But even the Auctioneer isn't a "direct lift" of that person's appearance. Some of the designing Imagineers have tombstones in the Haunted Mansion graveyard, but their names are scrambled. Are there any inside jokes of this nature in the Pirates of the Caribbean attractions? or read the book, of course! until they found a diagram of the board on the back of the original concept sketch. Marc wanted to make sure his eternal stalemate remained eternal! 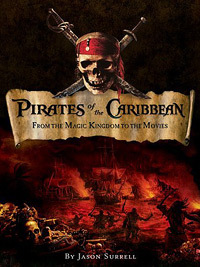 In regards to your upcoming book release (Pirates of the Caribbean: From the Magic Kingdom to the Movies, due out in early October), can you give a synopsis of what is covered? Were there any facets you weren't able to cover or include? Will your next book on the attraction cover more of the movies, or focus on the attractions? The Pirates book is almost identical in structure to the Haunted Mansion book. It covers the history of the attraction from the very beginning through its opening in four Magic Kingdoms. The middle section is a scene-by-scene "ride-through" of the Disneyland version, calling out the differences in the other parks. And the last section covers the making of the first film. I would have loved to have gone into even more detail, but there are only so many pages. There will be another book on the making of all three films, but I am no longer writing it. The production wanted someone who was on set every day to write the book. The upside is that fans will now get a truly first hand account of the making of the movies. The downside is that I won't get to spend nearly as much quality time with Keira Knightley. I can tell fans that the production team will be including more nods to the attraction in the second and third films, and they are a lot of fun! What contributions did you make to the recently released "Imagineering Field Guide to the Magic Kingdom at Walt Disney World"? The author, Alex Wright, came to me with the idea, thinking that it might be something I'd like to do for Disney Editions. He wound up writing such an incredible proposal that there was no reason he shouldn't do it himself. So I hooked him up with my editor, Jody Revenson, and he was off and running. Beyond that, I just chimed in with tidbits about my favorite attractions. The book was Alex's baby all the way, and I LOVE what he did with it. I found out a bunch of things I didn't know, and I think that's saying something. He's wrapping up the Imagineering Field Guide to Epcot as we speak. We're also developing a project together, something we're referring to as a "geo-biography" of Walt Disney that focuses on the effects Walt Disney and the State of California had on each other. It'll cover everything from the history of the Burbank lot to CalArts to Mineral King up in Northern California. It's not a done deal yet by any means, but we're very excited about it. Can you shed any light on your next book project? Right now I'm starting work on my next book, Disney Mountain: Imagineering the E-Ticket Range, which will focus on our mountain thrill rides at parks around the world. All the classics are in there: the Matterhorn, Big Thunder, Space Mountain, Splash Mountain - even Mount Prometheus at Tokyo Disney Sea. I'm also going to include some attractions that were never built, specifically Western River Expedition. I'm also developing From Star Tours to Indiana Jones Adventure: The Creative Force of Disney and George Lucas. That one's not a done deal, but both Disney and Lucas are interested in making it happen if we can. 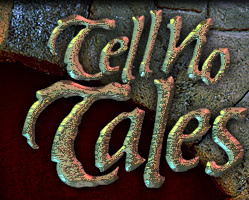 Be sure to join the TellNoTales.com Mailing List to be informed about new interviews and insights from insiders published here!